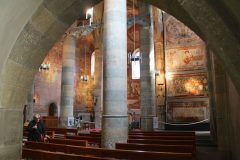 The Carolingian and Romanesque wall paintings in the abbey church of St Johan in Müstair are the greatest series of medieval figurative murals in Switzerland. 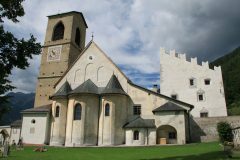 The church architecture of this UNESCO World Cultural Heritage-listed site in Graubünden is still predominantly Carolingian despite later Gothic additions. 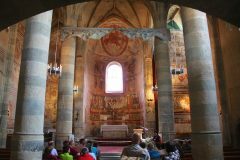 However, the cycle of Carolingian wall paintings featuring the lives of King David, Jesus Christ and some saints are the top reason to visit this small village in the far southeastern corner of Switzerland. 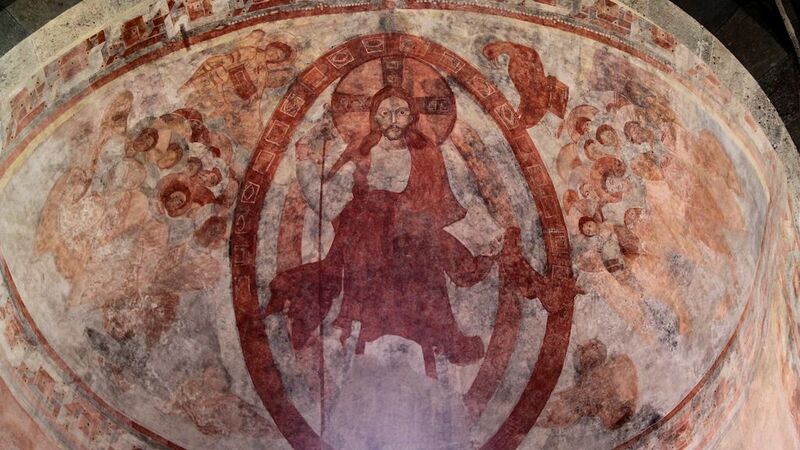 The main attraction of the Benedictine Kloster St Johan (Clostro Son Jon in Romansch) in Müstair in Graubünden (Grisons) is the Carolingian abbey church decorated with the most important cycle of frescoes of the Carolingian period preserved in situ. The Benedictine Monastery of St John the Baptist in Müstair was founded around 775 AD – possibly by Charlemagne himself to fulfill a vow he made for deliverance from a severe snowstorm while returning to Germany from his coronation as King of the Lombards in present-day northern Italy. The walls are smooth with the exception of the triple apses at the east end (with two further apses in the annexes). Here the apses form triumphal arches above the altars of the patron saints of the church. Typically for a Carolingian church, windows are very small and sparse. The original ceiling would have been flat and probably of painted wooden panels as can still be seen at Zillis. The Gothic vaulting, with support pillars that turned the central hall church into a triple nave, and gallery were completed in 1492 during the reign of Abbess Angelina Planta. The Carolingian wall paintings in St John’s Church contributed more than anything else to Müstair’s inscription on the UNESCO World Cultural Heritage list. It is a near miracle that so many survived from the 9th century to the present. 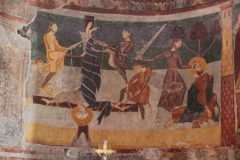 Originally, the walls of the church were undecorated but a fresco cycle were added probably by the mid-9thcentury – most of the paintings seen today date from this period. 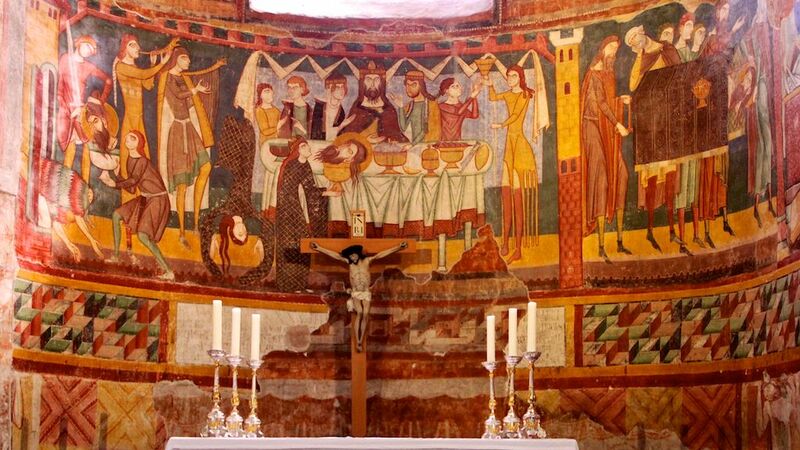 Around 1200, the Carolingian cycle was over-painted after the monastery changed into a convent – some of these Romanesque paintings survived in the apses. These in turn were over-painted during the Gothic period around 1500. In 1878, the by now mostly whitewashed walls received a historicist repainting. The Carolingian paintings were rediscovered by chance during the late 19th century above the Gothic vaulting. However, the Carolingian painting visible in the church was only revealed again during a major restoration of the church from 1947 to 1951. By then, some Romanesque paintings were literally falling off the walls or were carefully remove before they could collapse – some may be seen in the local convent museum. 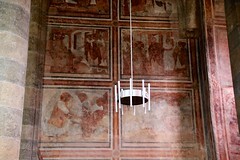 The designs of the Carolingian fresco cycle in St John’s in Müstair resemble a modern cartoon: the walls are divided into a grid with each rectangular block containing an individual scene. As with many cartoons today, this allowed the illiterate to follow the story. The paintings on the three flat walls are divided into horizontal bands. At the top, hidden by the Gothic vaulting, is the Old Testament story of King David. Some of these paintings were relocated to the Swiss National Museum in Zürich in 1908/09. The next three levels on the north and south walls deal with Christ’s childhood, Christ’s deeds and the Passion of Christ. The paintings on the lowest level are mostly lost and portrayed saints as successors to Christ. The west wall is decorated with the Resurrection and the Last Judgment. The eastern wall is the most decorated and has the best-preserved paintings. Here, it is pretty easy to distinguish between the duller Carolingian works and the brighter Romanesque paintings on the lower levels. The top painting in each apse shows Christ with the patron saints of the respective altars: in the central apse St John the Baptist, the north apse for St Peter and St Paul, and the south apse (currently closed for restoration) for St Stephan – the first Christian martyr. A few further art works worth noting in the church include a statue of Charlemagne, high reliefs and Gothic vaulting. Other items can be seen in the museum. Charlemagne is also honored in the painted Gothic vaulting by the coat of arm of the Holy Roman Emperor and the description of Karolus Magnus, as the “fundator et edificator primus”. 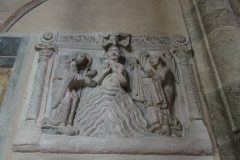 The high relief of the Baptism of Christ in the north wall is a Romanesque work, which was only mounted on the north wall during the Gothic restoration. It shows the baptism of Christ – the key moment in the life of John the Baptist and of more importance to Christianity than his more famous decapitation. Other items, including pieces from the Carolingian marble choir screen can be seen in the convent museum. St John’s Convent with Carolingian Wall Paintings for more details on the monastery complex and museum, opening hours and transportation. It is a beautiful drive by car or postal bus down the Val Müstair to reach this important cultural sight right on the Swiss-Italian border. More photos of Müstair on Flickr.